For years, I've been tempted to make paper jewelry, but for some reason haven't taken the leap. 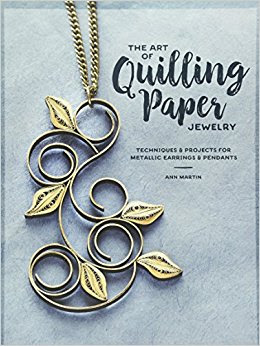 Then along came Ann Martin's book, The Art of Quilling Paper Jewelry, and BAM! You know what that's like right? For me, it's a weakness behind the knees and an impatient twitch of the fingers. 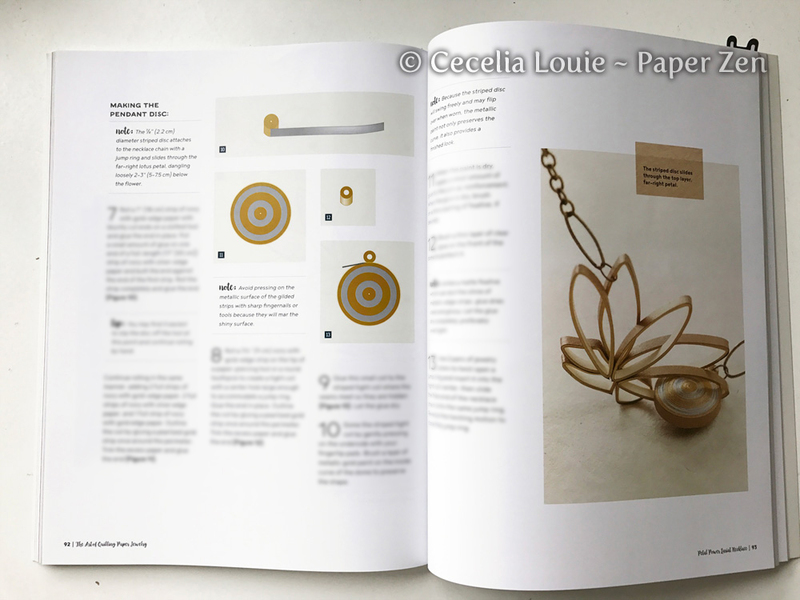 Although I don't wear earrings, I know a few people who do, and immediately embarked on a new adventure in paper. 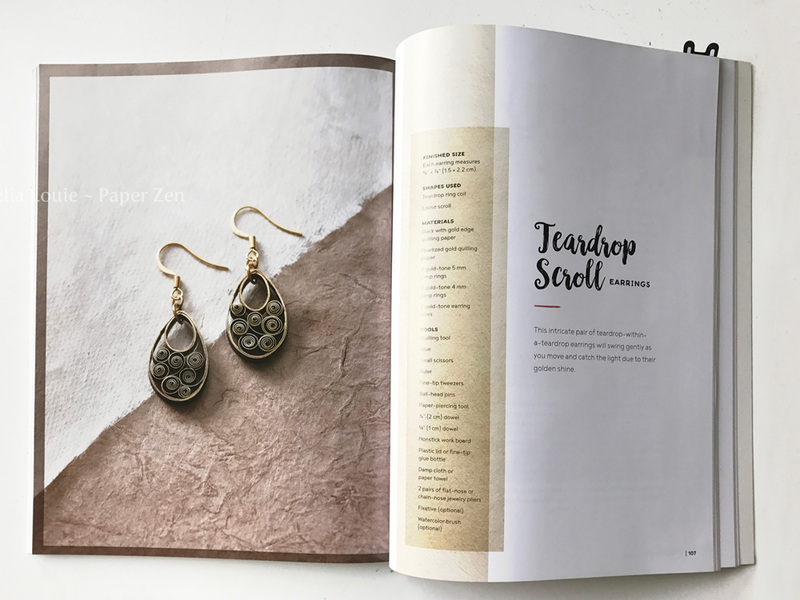 Each project in Ann's book starts off with a concise list of materials, shapes, and finished sizes so there are no surprises. The steps are illustrated and I highly suggest reading the beginning chapters to familiarize yourself with the basics. 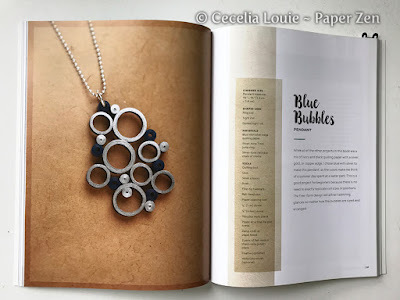 Although I've quilled for a while, there are many techniques and knowledge bombs specific to jewelry making, such as handling 3-ply quilled paper in Chapter 2. I have been SO curious about a Mandrel Set for eons, and finally broke down with this oh-so-valid justification. 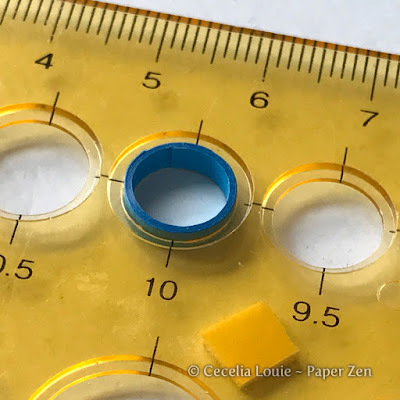 The mandrel's sizes are not marked, so I measured and wrote each width on the rings. 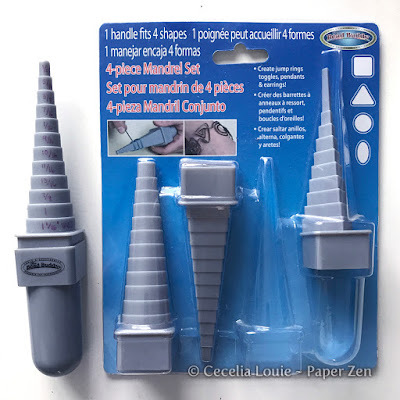 Since the mandrels are plastic, the quilling paper won't stick to it if any excess glue seeps out. Although it worked adequately, I found it tricky to slide the finished coil off without disturbing the overlapping layers. It'll still come in handy for the other shapes anyway, since a template won't work for a triangle, for example. 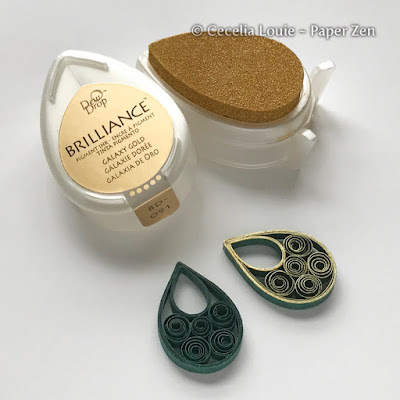 I actually found it easier to allow the coil to relax within my dollar store circle template. This allowed me to glue the inside end, then pick up all the coils with a tweezer and glue the outside end closed. Look closely and you'll see a small adhesive foam square under my dollar store template to raise it up to about the middle of my strip, keeping the coil well constrained. I also like ensuring my edges are all aligned, and found it easier to keep the edges even while it's lying flat on my table. 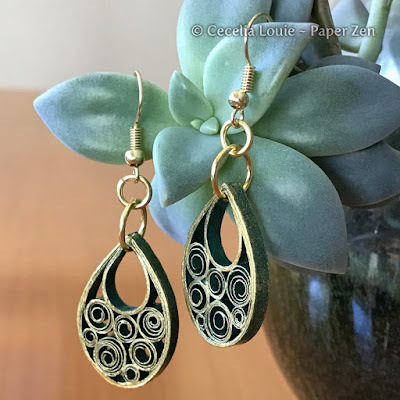 Ann made her earrings with black quilling paper with a metallic gold edge, but since I already had a Brilliance Galaxy Gold ink pad, I decided to try it with regular quilling paper. This way I could dab both sides of the earring so there would be no "front" or "back". The coils tended to move a bit while getting dabbed by the ink pad, so I pressed the earrings on a Post-It Note and voila – they behaved! 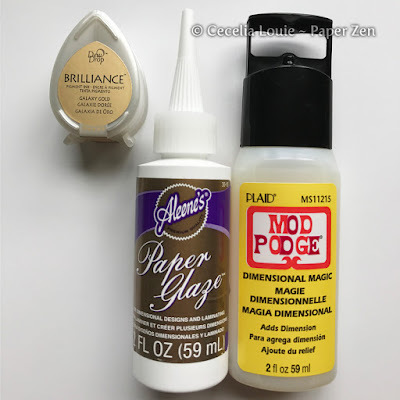 I tried my Post-It Note technique while testing with both Mod Podge Dimensional Magic and Aleene's Paper Glaze, because both are not very thick, and liquid tends to make the coils swell out of shape. I dabed lightly on top with a paint brush, then followed up with a thin brush between the coils to allow them to set in place. Perhaps I was too impatient and removed it from the Post-It Note before it truly set? In any case, the coils did swell a bit, but I think a non-quiller will let it pass. Here is a 3-ply test strip, with Aleene's and Mod Podge on top. Look closely to see the original Brilliance ink pad sheen in between. 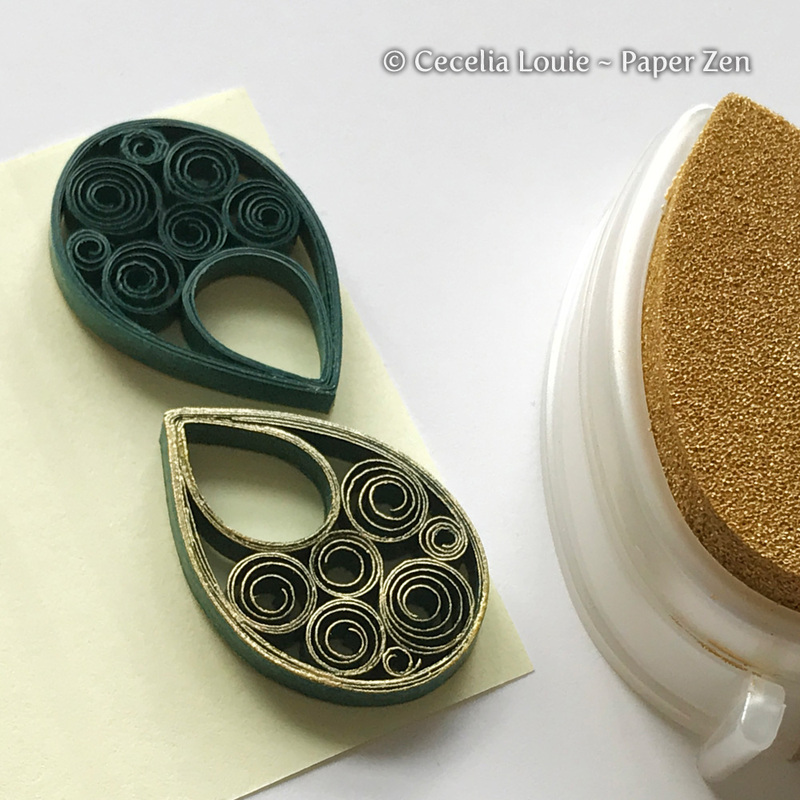 Even though both coated the sheen well enough, they worked better for thick strips as shown rather than the thin coils with the teardrop shapes. Finally a reason to shop in the jewelry section at Michael's! I hope you'll let me know what you think of my earrings in the comments below. The friend I plan to give it to loves green and gold. I also dabbed the ink pad very lightly around the outside edge of the paper, creating an organic speckle, which I hope mimics antique metal. New and advanced quillers can appreciate Ann's acute attention to detail. Her impeccable care is evident in all the photos of every project. I'm just itching to try the Blue Bubbles because it seems like pure fun and easy to do! And just look at this divine Petal Power necklace. It's zen-like quality beckons the eye to keep admiring the delicate blossom. 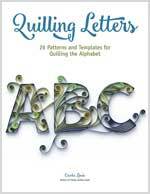 I'm so happy Ann's book, The Art of Quilling Jewelry is in my library and pushed me off the ledge of hesitation. DISCLAIMER: Although I was given a copy of Ann's book, my thoughts in this review are my honest opinion. Thank you so much for this post, Cecelia, I'm delighted you're enjoying the book. You always have such good ideas and that's truly the case here... how cool is your Post-it Note tip! You've proven that a metallic stamp pad does an admirable job of gilding paper, so thanks for sharing that too. Happy to hear you like my "MacGuyverisms" Ann! Thank you for writing such an inspiring book! Can't wait to try some of this out. SO sweet of you April! Thank you for making my day! <3 <3 to both of you!